In an unprecedented move the Government announced a “pre-budget relief package” promising more in the upcoming budget, billing a total of Rs. 4.4 billion per annum. The concessions, which included a host of low-interest loans offered to small and medium enterprises and the slashing of the telecommunication levy effective from September, are aimed at giving impetus to the country’s economy and are expected to create 50,000 new jobs, Finance Minister Mangala Samaraweera said while announcing the concessions. “We want to make Sri Lanka an entrepreneur’s paradise. The concessions are aimed at encouraging youth to take up entrepreneurship. Two of the most important things in small-scale industries are communication and transport and we have taken steps to give concessions in both areas,” he said. The concession schemes rolled out will help generate 50,000 more jobs in the country, the Finance Minister forecast. 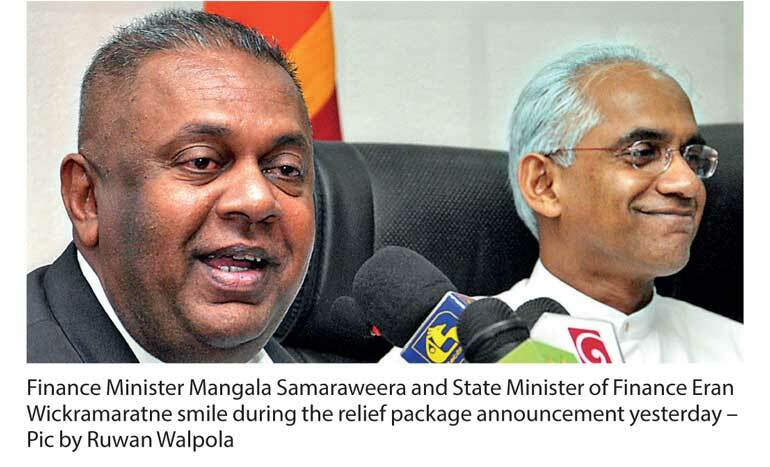 Samaraweera was also upbeat about maintaining a 4.5-5.0% target growth rate for the year despite the severe impact from the drought which is affecting over 1 million people in the country. The short-term measures announced by the ministry as a pre-budget relieve package will be followed by long-term measures in the 2018 Budget, Samaraweera revealed. State Minister of Finance Eran Wickremaratne, speaking on the relief package, said it will encourage the female labour force to move towards entrepreneurship. The Ministry has decided to remove the much-debated telecom data levy of 10% from 1 September. A 2017 Budget proposal was to increase the levy to 25%, State Minister of Finance Eran Wickremaratne said. Samaraweera stressed that the SME sector should take the lead in economic growth in the country, targeting external markets as well. “Small and medium enterprises must be responsive to changes in the economy and lay the foundation for economic development,” he said, adding that the announced concessions will help boost the sector. The relief package also includes eight concessionary loan schemes aimed at facilitating SMEs and boosting export-oriented businesses. The loan schemes rolled out by the ministry were proposed in the 2017 Budget, the Minister said. Under one of the eight loan schemes, Jaya Issura, aimed at boosting the SME sector, businesses engaged in agriculture, fisheries, poultry, horticulture, home gardening, engineering, printing, tourism, handicrafts, garments and ICT, with an annual revenue between Rs. 25 million and Rs. 250 million and employing 10-50 employees, will be able to obtain loans up to Rs. 50 million at an annual interest rate of 6.54%, while the upper limit of the loan amount is double for ventures focused on export markets. Under the scheme, businesses with annual revenue of Rs. 250 million-Rs. 750 million will be eligible for a loan facility up to Rs. 200 million while the amount will double for export-oriented businesses. The annual interest charged on the loan will be 9.81%. The Government has allocated Rs. 750 million for interest subsidies, the Minister announced. Further, import levies charged on motorcycles, single cabs and mini trucks have also been revised. Accordingly, customs duty on mini-trucks and single cabs has been reduced by Rs. 300,000 while ad-valorem excise duty on motorcycles with an engine capacity of 50cc-150 cc has been reduced by 90% from midnight yesterday, the Finance Ministry said.